The data and trends that we are collecting are meant to reflect how governments use social media. Our primary interest is in the U.S. federal government, but we also are interested in state and local governments in the U.S., as well as international governments. Over the last few years, the U.S. military has become more active on social media. Some branches have been more active than others. For example, over a three week period the US Coast Guard posted 110 pictures and videos on Instagram, where as the US Army posted only 25. However, post activity on Instagram only tells part of the story. In our evolving dashboard below, we are collecting data and reviewing posts to determine how the Air Force, Army, Coast Guard, Marines, and Navy use Instagram, as well as how people interact with their accounts. What images and videos tend to be most popular and why? Who does our military communicate with on Instagram and why? And who are the most visible leaders in Instagram when it comes to our armed forces? 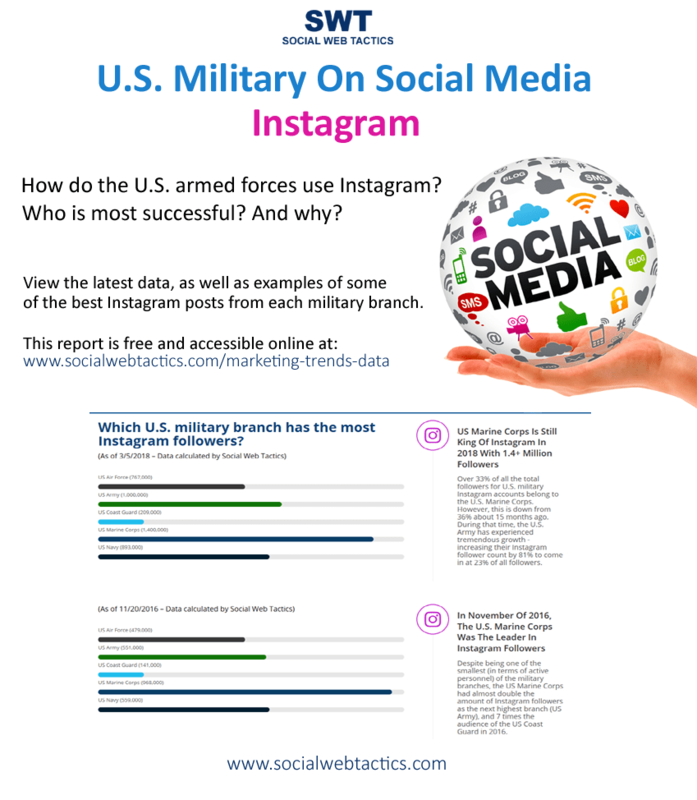 The purpose of this data is to help citizens, businesses, and other government agencies understand what is of interest to, and how to communicate with, the different branches of the US military on Instagram. Social Web Tactics is a digital marketing and sales agency that creates dynamic research reports, and conducts detailed analysis on industry trends covering a wide variety of industries and audiences. Interested in gathering greater insights and developing new strategies for your business? We are ready and able to help your company develop and execute a successful strategy that leads to greater growth.